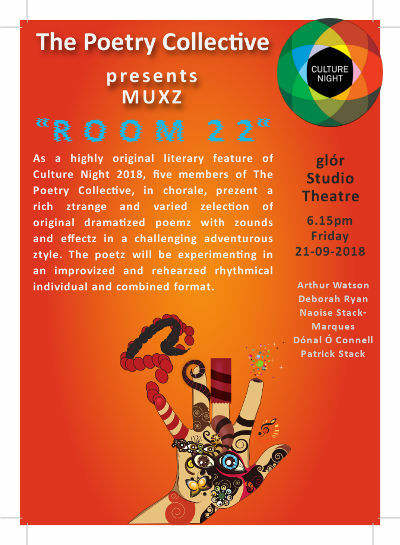 Room 22 Culture Night is The Poetry Collective’s latest and greatest MUXZ and our contribution to Culture Night 2018. It got its dress rehearsal on 01 September 2018 at The Record Break Café, Ennis but has since been improved and tightened up by weekly rehearsal work. The performance takes place on Friday 21 September at 6.15pm sharp in the Studio Theatre, glór, Ennis, and lasts for just over an hour. As the event is for Culture Night, entry is free gratis. 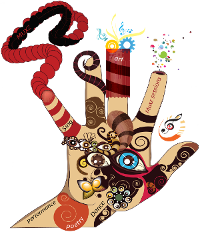 Room 22 features original poems by all five participating poets, namely Arthur Watson, Deborah Ryan, Naoise Stack Marques, Donal O Connell and Patrick Stack, in addition to musical interludes on saxophone and oboe as well as other performance enhancements.